A low or indistinct continuous sound, a sound that lures the human being. Rauschen, german word symbolising several noises such as rushing water, the rustle of the trees or leaves, the hiss coming from a radio, the roar of the sea, the swish of silk or rain that pours down, is the title of the new piece by Sasha Waltz and Guests but, the given examples translating it, are not quite appropriate to what can be found on stage. ‘I am so tired’ by John Lennon and Paul McCartney opens the piece while still close curtains, don’t allow to see what’s behind. The stage is finally unveiled as the song ends and an extended but contracted standing female body, surrounded by silence, appears stretched and blooming with some hints of hesitance and fragility. She starts shuddering while she moves as an half bird, half woman elegantly scattering her long and well-turned limbs. New bodies enter the bright stage almost enveloped by a giant softly concave wall behind them. They all move across the dais with robotic, quite unnatural walks and the scene appears clearer as they start interacting towards each other. The robotic scenario composed by dancers-humans and dancers-robots is what emerges from the general scattered dynamics that will develop in following and numerous theatrical images in motion. The dancer-humans share their own frustrations, fears, insecurities with the robotic beings trying in vain to find comfort and reassurance. The artificial intelligent identities are capable to listen and give answers but they are completely missing the empathy and the real understanding of the person they are interacting with. The strong and exasperated reactions of the human-dancers towards those human-machines is indeed touching allowing to perceive the annoyance and irritation, disappointment and anger caused by the frustration to talk to someone who is not listening attentively or who is not understanding at all. The issue is very much up to date in the contemporary / futuristic reality considering that the majority is not willing to listen to each others problems. It leaves space to reflect on a topic that is enlarging and leaving specific marks on the humankind’s behaviour. Independent but isolated and often alienated, the human being with his own technological gadgets, is incapsulated in his own world not being able any more to approach instinctively. Screens as shields, short texts instead of voice confrontations. Reflections about the threatened communication, the disappearing active listening practices, the seldom mutual support, solidarity that is hard to find and general lacking of authenticity, are here brought on the surface in a set made out of behaviours’s incongruences including detached reassurances, flimsy appreciations and shallow, hypocritical empowerment. The dancers share some compelling private stories and thoughts, sometimes using their own languages while they fling their arms, bend on and backwards, strongly twist and arch their backs hurling themselves in different parts of the stage. Many striking images take form in particular generated by the artistic set design. Fascinating are the moments when the wall absorbs the words NOW, ALIVE and GODS, written several times to constantly disappear as the same wall sprayed black but resulting an illusional effect, since what is meant to be black colour, drips down on the floor as crystal water. Adding on quite magical are the black tablets absorbing parts of the dancers’s bodies impressed by the warmth, once again disappearing after a few seconds. Fugacity is what emerges through these effective images; fugacity of information, of bonds, of situations, of appearance, of currents, of contents. Several remarkable scenes, phrases and screams stay vivid in the memory and evoke piercing turbulences and sorrows. The performance, seems to be divided in two parts and the second one starts after the tablets abandoned on stage for a few minutes. Probably would have work to have a pause in between since the piece is condensed with uncountable images and the continuation will be as dense as the first one. The dance part, much more fluid in the second half, appears not very demanding nor challenging but still pleasant to watch looking at varied bodies that flow altogether, everyone with their own time and corporeality. The whole piece connects well to the idea of rauschen interpreted as white noise such as a random signal having equal intensity at different frequencies giving it a constant power and density. It is exactly this sense of randomness interlaced with an ongoing power and density what remains and keep vibrating after having seen the performance. Strongly didactic contents are inserted in the structure of the piece making it politically correct and moralistic. Particularly strong the paradox when those contents are recited with suffered struggle by a dancer. With all his forces he hangs at a suspended bar while another one makes him repeat the long list of ethical constitutional points, as it would be a torture lesson inflicting pain in order to make remember. The dancers thrive in their solos and in general the complexity and dominance of the whole group is expanding every time they find themselves together in structured, schematic or disseminated forms. The microphone that are attached to the bodies at first are not the best solution since, at least on the day of the premiere, were not working properly. Moreover, a strong direct voice, is much more effective and convincing and it is evident when one of the dancers, with no attached microphone, shares his personal moving story between the cemetery of black tablets that absorb and release transitory images resembling the pain related to the awareness of the ephemeral condition of the humankind. 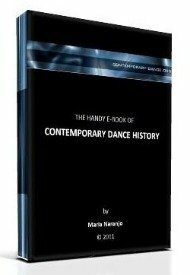 Submitted to contemporary-dance.org the 14th March 2019.